Protocadherins. PCDH19-related epilepsy is the second most common genetic epilepsy, behind Dravet syndrome. PCDH19-related epilepsies display the unusual X-linked inheritance pattern in which heterozygous females are affected but hemizygous males are unaffected. Similarly, somatic mosaic males have also been reported. PCDH19 encodes protocadherin 19, a calcium-dependent cell-cell adhesion molecule that is highly expressed in the central nervous system. The long-hypothesized pathomechanism has been cellular interference, although experimental support has so far been lacking. Now, Pederick and collaborators provide evidence that supports the cellular interference mechanism in PCDH19-related epilepsies, bringing us closer to understanding the biology of this unusual genetic epilepsy. PCDH19 mechanism. The differences in cell adhesion affinities lead to cellular interference in people with PCDH19-related epilepsies. In unaffected individuals (top panel), all cells in the developing brain have the same adhesion properties, leading to proper cell sorting and cell connections. In people with PCDH19-related epilepsy (middle panel), two cell populations exist: cells with wildtype PCDH19 and cells with variant PCDH19. These cells have different adhesion properties and therefore do not sort properly. Proper connections are not are not formed between the two cell populations. In males who carry a PCDH19 variant (bottom panel), a single homogeneous cell population exists. All of these cells have the same adhesion properties and therefore are sorted properly and have proper connections. Cellular interference. 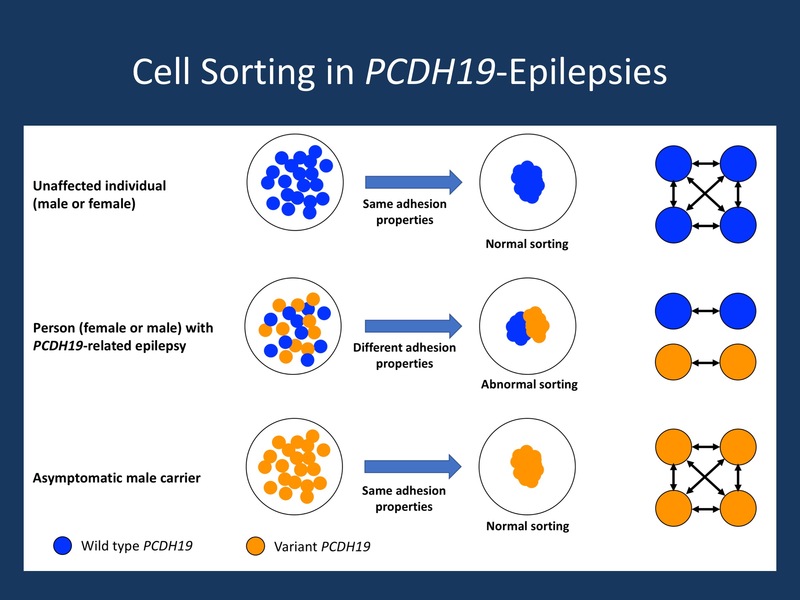 The theory behind cellular interference is that two distinct cell populations exist in the developing brain of people with PCDH19-related epilepsies: cells containing unaltered PCDH19 and cells containing variant PCDH19. These two unique cell populations do not form proper connections with one another, leading to disrupted networks within the brain. However, in hemizygous males who only have one copy of PCDH19, a homogeneous cell population exists. Even though these cells carry a variant version of PCDH19, the fact that only a single cell population exists leads to the formation of proper connections. Therefore the existence of two types of cells – and not the PCDH19 variant itself per se – has been proposed to be the main driver of the phenotype in PCDH19-related epilepsies. Experimental evidence for the mechanism. Protocadherins, including PCDH19, are adhesive molecules sticking out from the cell surface and can be conceptualized as the tiny hooks and loops of a strip of Velcro. PCDH19 is expressed in the brain with other types of protocadherins, and the various combinations of protocadherins determine a cell’s adhesive properties and thus how it is sorted during cortical development. Cells with similar adhesive properties are sorted together. Pathogenic variants in PCDH19 result in loss of adhesive function, which alters the types of cells the cell adheres to and the way it will be sorted during brain development. Pederick and colleagues discovered that the brains of female mice who only had one functional copy of PCDH19 – equivalent to people with PCDH19-related epilepsy – showed distinct cell populations that were unable to adhere properly to one another. The cells expressing wildtype PCDH19 had normal adhesive properties, whereas the cells without PCDH19 had altered adhesive properties. The presence of two different adhesion affinities led to missorting of cells during brain development. This abnormality was not seen in male mice who completely lacked PCDH19. In the brains of male mice completely lacking PCDH19, neurons sorted appropriately because all cells exhibited the same adhesion affinities. The authors expand their study by further describing abnormal cortical sulcation patterns in four female patients with PCDH19-epilepsy, suggesting that subtle brain malformations may be a feature of this missorting process. However, due to random patterns of X-inactivation, the severity and presentations in people are likely highly variable. What you need to know. Pederick and colleagues report evidence from mouse models of PCDH19-epilepsy that supports the cellular interference model. They demonstrate that the heterozygous cell populations – cells containing wildtype PCDH19 and cells containing altered PCDH19 – segregate abnormally during brain development. This alteration is not seen in male mice completely lacking PCDH19, which is consistent with what we see in humans. The authors further suggest that subtle brain malformations may be a part of the PCDH19 phenotype as an extreme consequence of this missorting process. This entry was posted in 2018 and tagged cellular interference, PCDH19. Bookmark the permalink.